PRICE REDUCED!! Your family will love this home! Guard Gated Community. Great floor plan with 3 bedrooms, 2 1/2 baths, multiple dining areas, separate living and family rooms, Wet Bar, fireplace plus den/media room. 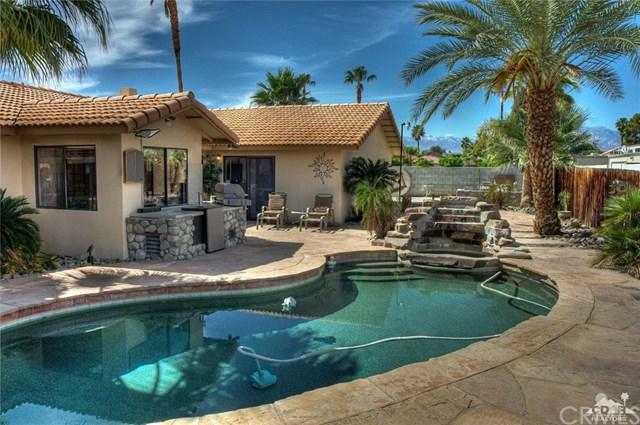 Large lot with beautiful pool and spa. Attractive, usable front courtyard. 3 space garage and secondary access from rear to a concrete driveway that is large enough for a motorhome, toys or boat. Bring your decorators touch and you can have a great home that will provide fun for your family for years to come. Golf and Social memberships available at Bermuda Dunes Country Club under a number of optional programs. Sold by Tommi Lennon of Bennion Deville Homes. Lot Size Dimensions 101X107 Approx. Inclusions Submit With Offer. Seller Will Consider Leaving Washer/Dryer And Some Other Personal Property if Buyer Wants.